Bismillah Assalamua'alaikum and Hello! 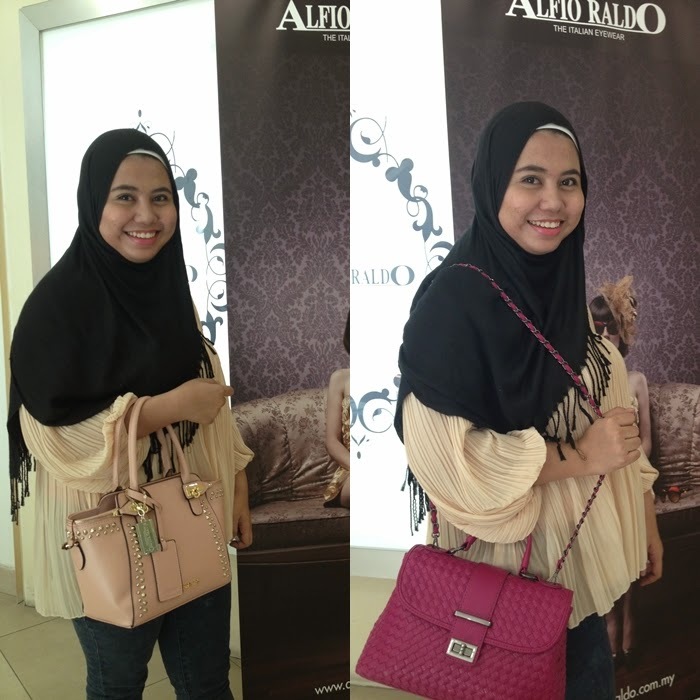 Last Thursday, I was invited to an Evening Gathering with Bloggers at one of Alfio Raldo Boutique at The Weld Shopping Mall, Kuala Lumpur. For your information, Alfio Raldo is one of the top brand for fashion enthusiasts, as they have an up to date handbags and shoes collection to offer to their customers. Alfio Raldo latest collections so flamboyant and elegant with attractive and bold colors that suits any occasion from formal to casual event. From my observation, the colors that they offer in this collection are vibrant and suitable for every age state. In this collection, they are focusing to the teenagers and early twenties women, because from here you can see the colors that they offers are vibrant and more chiq. Suitable for everyday and hanging out with friends. Meanwhile, for sophisticated women, who love their job, these two handbag can match you up. The design are simple, and the color are more down to earth type of color. Suitable for office wear. For me, this type of bag can put a lot of girls stuff (as usual). Here are some of design that match teenagers and also working women. Brave to bring up red and bright blue? you should own these two bag. And for simple women with elegant taste, this design can meet up your standard, I love the detailing on the surface, make it look elegant and rich! Besides handbag, AR also offers Shades for women and men. The design of the shade can easily match to every women as they offers the typical shades for everyday use. A part from that, AR also have many range of watches for man and women. Their latest design for watch are the Ceramic watch. The special about this ceramic watch is that they are cold and the colors are soft compare to steel watch or leather watch. Beside that, they also have a colorful range of rubber watch. These watches are unisex. the colors are vibrant and bright. Suitable for those who love to stands out more from others. 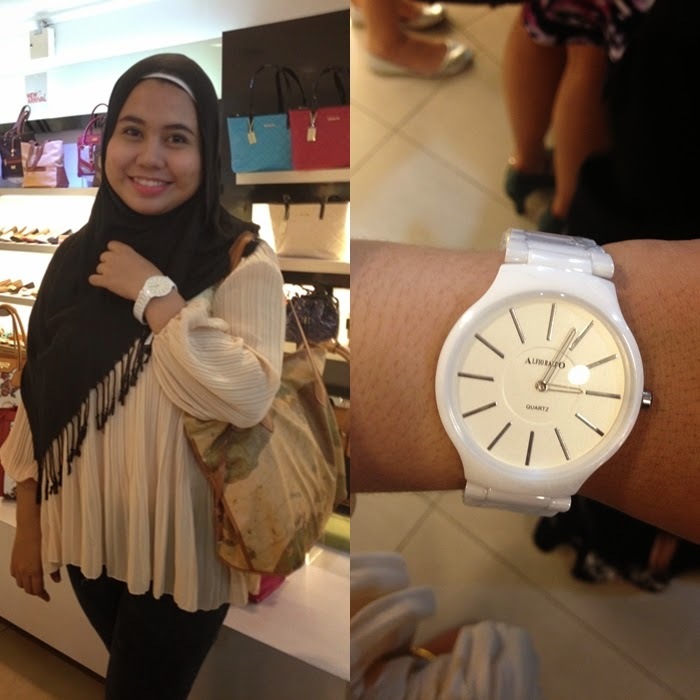 The owner of AR was so generous to give me one of these rubber watch in white. Me model for the White ceramic watch! look elegant right..
And the best part was, the shoes! !I can say that the design By Alfie Raldo are superb, There are many heels, balm shoes and wedges that are stunning and also cute, with affordable prize. Not to forget comfortable too! Oh I almost forgot, here are two of favorite handbags for the colored range. Trapezium handbag in Peach Color and this Purplelish sling bag with webbed style. Why did I pick this two? First, the colors. I have been wanting a purple handbag for such a long time. And when the first time I entered the boutique, this purple beg had catch up my eyes. It has the warm color and the webbed style makes it even more beautiful. Next was the peach trapezium bag. The detailing on the bag makes it stand out from the other bag. It has the gold knob around the edges make it so elegant and classy. So, I think that's all from me today. For those who wanted to visit Alfio Raldo, you can stop by at The Weld Shopping Mall or you can visit any website such as, Iprice, Lazada or Zalora to buy it online. Bismillah Assalamua'alaikum and hello readers So, in my last blogpost, I did mention with you about the price change before and after GST. If you haven't read it, click here. Today, I will share with you some of the upcoming menu that will be serve at The Manhattan Fish Markets outlets. If you are their regular customers, you might have seen their King Crab Menu, right. But this time, they will announcing new range of menu, that involve LOBSTER!!! What?? Did you know that even at Bazaar Ramadhan they sell LOBSTER fro RM200 ++ OMG, so cruel right. 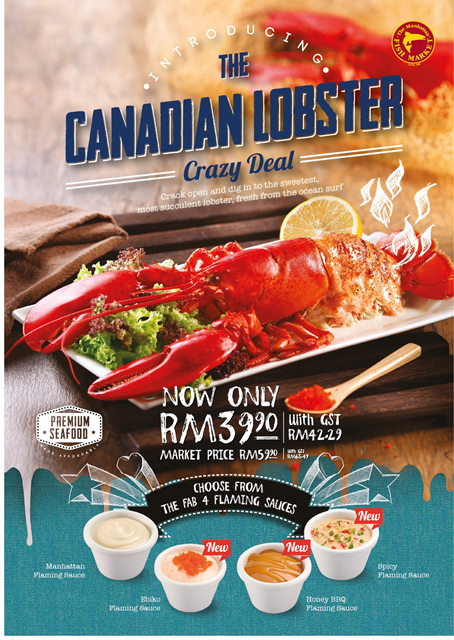 But here at The Manhattan Fish Market, we can enjoy lobster at RM39.90. So cheap! Each sauce have their own taste and my favourite is the Ebiko Flaming Sauce. The best part about this lobster is the lobster meat is tender and it absorb well with the sauce. the most part of the meat is at the crusher or what do we call the lobster's hand... ( in Malay we call it Sepit). Not only that guys, MFM also serve the Lobster Platter. and guess what's the price is ? RM79.90. You can have a big Canadian Lobster and filled with some other tasty snack such as fried fish fillet, Crunchy fries, Mussels and also Garlic Herb Rice beneath the lobster. Beside that, MFM is doing a contest now for this Giant Lobster that is call Guess the Giant Lobster Weight! 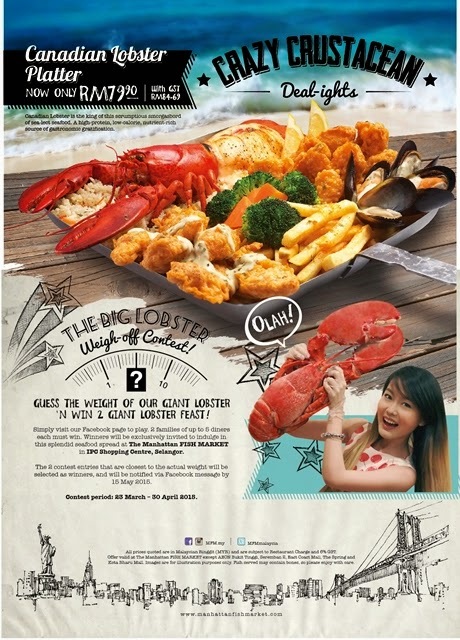 You can win 2 giant lobster feast and exclusive invitation to indulge in this exclusive event at the MFM AT IPC Shopping Centre. How to join this contest? Just log into your FB and go to MFM facebook page. 2 families of up and 5 diners must win each must win. The 2 contestant with the closest weight will win above prizes. A part from that, I did try out some of their new menus at MFM. For the starters, MFM serve us The Oyster Roulette. 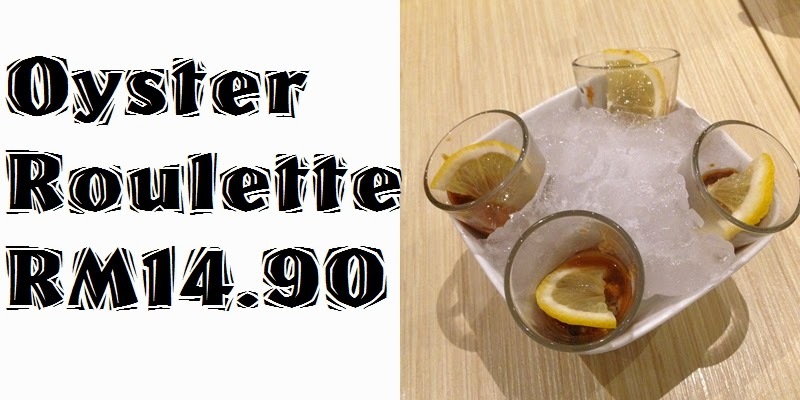 Each cup contain Oyster that is mixed with some spicy ingredients. Squeeze the lemon, and wallahh! there you have it, Oyster Roulette. among this four cups, one of it has the spiciest taste. But we don't know which one has the spiciest. So, for those who had that cup, prepared to be fill with spiciness!! 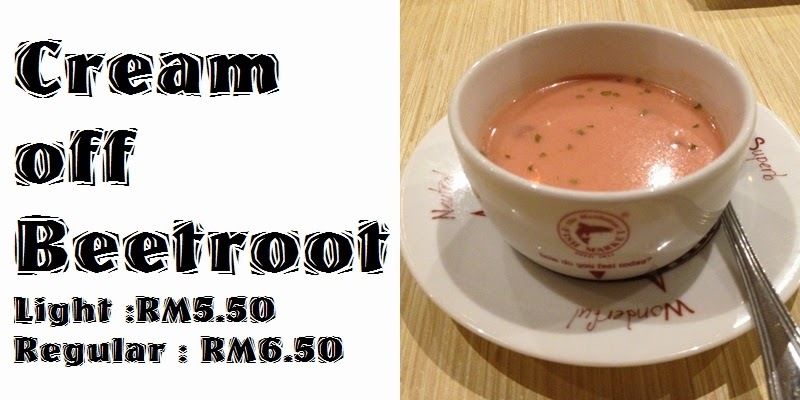 Next, I was serve to the Bursting with beetroot goodness, this pink-hued soup is light and keeps your blood pressure and heart healthy. Light - RM5.50 Regular - RM6.50. This is recommended to Vegetarian as this soup is rich with Beetroot tasty flavor plus creamy taste of it makes it a unique soup try out! Now we proceed with the main course of. First is the Fishy Chicky Bang Bang. 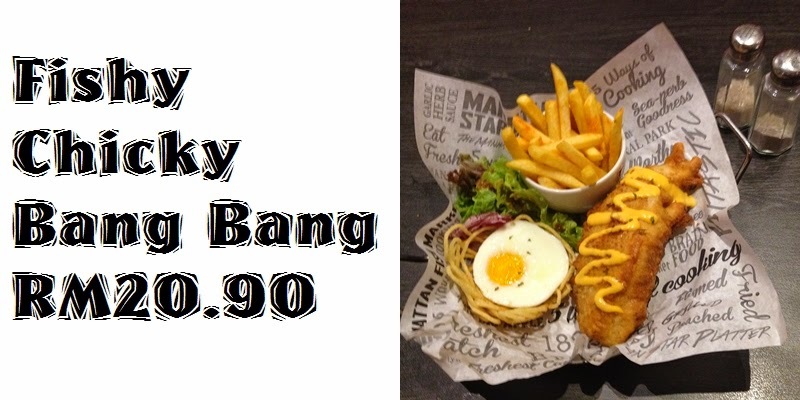 This is a unique combination, where, the fried fish fillet is attached together with the Fried Chicken Fillet and serve with crispy fries, fried speghetti and egg. The cheese sauce that is spread above the fried fillets are the best!! This menu rock babeyh! I really enjoyed the Fishy Chicky Bang Bang until I tend to shake my shoulder and everyones laugh because of it~! hahaha. The "Bang Bang" words makes me wanna shake it off babeyh! For those who love cheese, this may be the ultimate meal for you. Presenting, Flaming Cheesy Baked Rice. Below the flamed cheese is golden fried rice with bed of Coriander and you can find the hidden Rosemary Herb House under the cheesy dory fillet. Serve with boiled carrot and broccoli. This is an amazing menu, Grilled Salmon with black pepper sauce. plus, mashed potatoes. This menu is rich with protein and carbs plus, some veges might add the nutrients inside it yah. 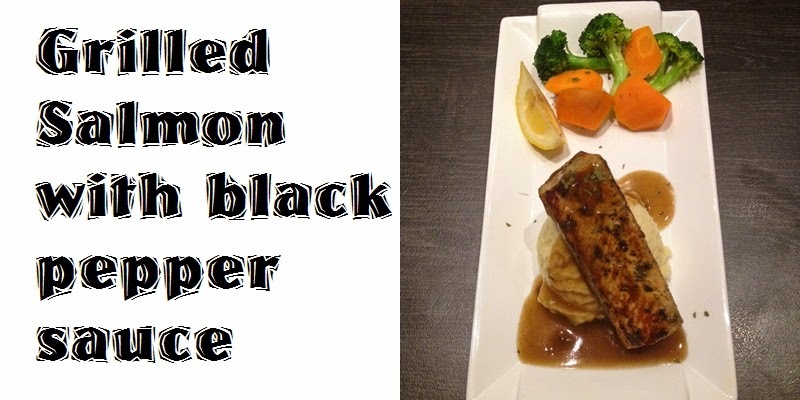 What I love about this menu, is the salmon is well cooked, not too dry or too moist, Just in the great way to eat up, plus the black paper sauce mixed well with the mashed potatoes and the salmon. Bravo! Last but not least, is the Dessert. Presenting Icy Hot Fish bananas. Where is actually the fish? These fillets are crispy breaded fish banana fritters paired with a scoop of creamy Vanilla ice-cream and strawberries. Simple and Indulgence! Meanwhile, Vienna Coffe is a double shot of strong espresso finishes with a pleasing cap of whipped cream dusted with cocoa. For a traditional experience, sip your coffee through the cream top. I love sipping through the wipecream, makes the coffee more creamy. MidValley Megamall, Pavillion, Sogo KL, Wangsa Walk, Ampang Park, Subang Parade, IPC Shopping Centre, Sunway Pyramid, eCurve, AEON Bukit Tinggi, Setia City Mall, Alamanda, Queensbay Mall, Juru Auto City, Sunway Carnival, All Season Place, AEON Seremban 2, The Spring Mall, Amanjaya Mall, AEON Kulai Jaya, AEON Tebrau, Mall of Medini, Nu Sentral, KB Mall, Komtar JBCC, Quill City Mall, IOI City Mall, Palm Mall Seremban. 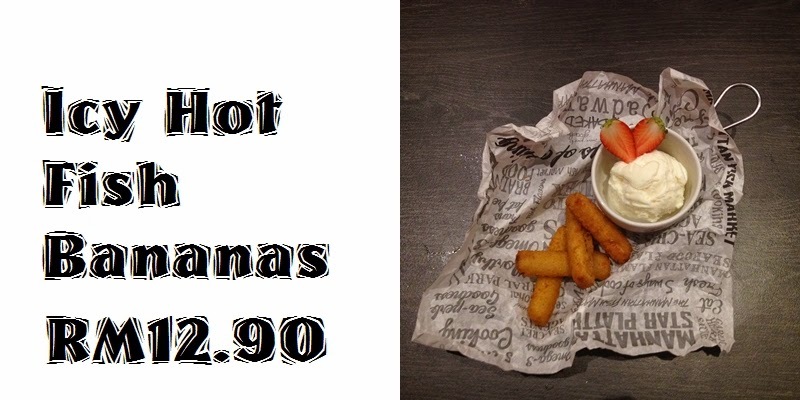 Does GST affect too much on the Manhattan Fish Market Price?? 6 days before GST starts in Malaysia, now many campaign and seminars being held to educate customers on how GST works. Even in the restaurant such as The Manhattan Fish Market wants their customers to know how GST does not affect too much on the price. 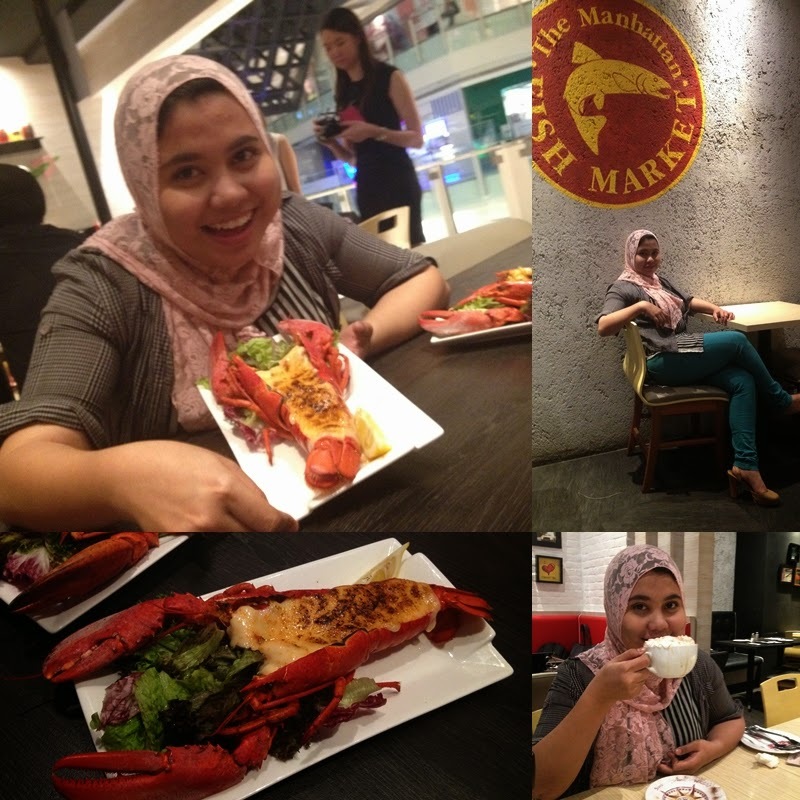 So last Saturday, I was invited by Isaac to attend a food review at The Manhattan Fish Market Nu Sentral. But this is not a regular food review, the marketing team also taught us about the price before GST and after GST being implemented. In this blogpost, There will be calculation, so make sure to stand by your calculator beside you and correct my calculation if I'm wrong. Let say you dine with 1 Sharing Platter that cost you RM57.90. Can you see the difference guys? The difference after GST is only RM0.30!! But if you have higher price compare to the sharing platter,it will cost you more than RM0.30. Therefore, the total is = RM140.69 + RM8.44= RM149.13. Here, we can see the increasing pattern is about RM0.30-RM 0.70 after GST at the total price. I hope that this entry can give enough explanation about the price before and after GST. And this will not make you afaid to come and dine in at The Manhattan Fish Market. Visit the nearest Manhattan Fish Market now to enjoy delicious sea food and I guarantee you will satisfy with their menu and the price that they've offer. Wait for my food review next guys. Last Friday, KFC had a Blogger Party at KFC Pavilion. 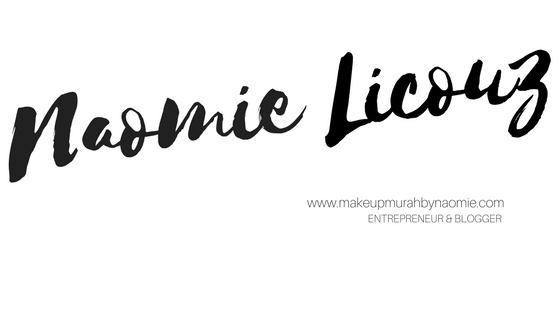 About 30 bloggers attended this event and we were introduced by their latest product that they had launched 5th March 2015. During this event, we had really so much fun! There were games with amazing prizes. For your information, KFC had launched a new product. 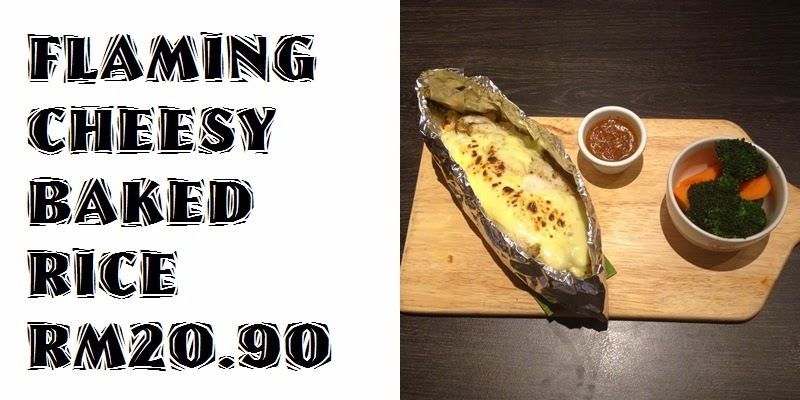 Only RM4.90 you can get a scrumptious well-balanced meal that is so convenient to eat anywhere and anytime. Presenting KFC Zinger Rice Wrap! This meal consist on toasted tortilla bread, packed with Colonoel rice, fresh tomatoes, onions, crunchy cucumbers and delicious mayo-lime dressing. So yummy! Thinking about it right now, made me wanna grab one now! A part from that now KFC has a line of promotion, #GrumpyNoLunchFace Instagram photo contest. KFC with Fly & One FM has launched this campaign so that KFC fans can be part of it. Just took a photo of your grumpy face for not being able to have lunch due to the busy schedules, and hashtag (#) the pictures with a creative captions. Winners will receive prizes and a surprice from KFC and the radio stations. So, come fast Malaysian, this promotions starts from 5 March while stock last. Visit your nearest KFC outlets to grab your KFC Zinger Rice Wrap now! The search of Asia's Next Top Model Season 3 has began ladies. Now 14 beautiful girls all around Asia were compete to each other to become the new Asia's Next Top Model. Featuring Superstar model Georgina Wilson as the host and creative director Alex Perry and Model mentor Jeoy Mead-King as the panels of the judges. These judges will guide the model-hopefuls through high-stakes catwalk shows, fashion photo shoots and publicity appearances- a rigourous modelling boot camp to discover who among the girls deserves to be on top. The programmed was shot in Singapore. For airing, it is only available on StarWorld (ASTRO Channel 711 / 722 HD). ZALORA, Asia's online fashion store announced their partnership with FOX International Channel for Asia’s Next Top Model Season 3. 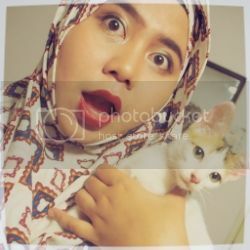 Each contestants will be glam and style in ZALORA's high street fashion outfits as ZALORA's always supports Asia's form of beauty and seeks to empower women through fashion by giving them the confidence to own whatever moment they find themselves in, said Giuloi Ziloyannis, Managing Direcetor of ZALORA Malaysia. Melissa Tan Li Hsia and Shareeta Selvaraj are proud representatives from Malaysia. They will be competing with 12 other girls to be named Asia’s Next Top Model. The winner of Asia’s Next Top Model will be named the 2015 Face of TRESemmé in South East Asia and the Face of ZALORA, and she gets to drive and own a brand-new Subaru XV STI. The Top Model will also be given a cover and fashion spread in Harper’s Bazaar Singapore. And for Malaysian contestants---> do make us proud. We know both of you have the potential to become the next top model in Asia. MALAYSIA BOLEH!! Don't forget guys, 4 days until the official episode of AsNTM start at Star World.